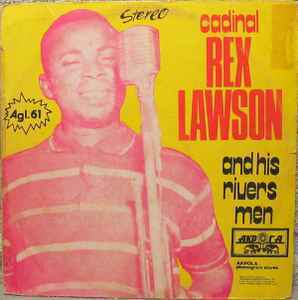 This release spells Cadinal Rex Lawson And His Rivers Men on jacket but Cardinal Rex Jim Lawson And his Rivers Men on label. Jacket refers to cat.# AGL. 61 while the label and matrix runouts refer to cat.# AGB 002. Label is Akpolla Nigeria. While jacket is Akpola Phonogram Stores. This is the 12 track Nig. Akpolla orange label original release...date unknown. There is a 10 track Benin Akpola yellow label release (10" and 12"). The listing here will be taken from the information listed on the label.